Sandy, those look a bit like a red toile du jouy on cream background. I’d recommend you try: Country Curtains. I have been looking everywhere for those curtains too! The same curtains (or really similar ones) are in the living room as well. I have watched it over and over and they are not toile du jouy they are more like a floral design or something. Does ANYONE have any ideas! I REALLY would like to put them in my kitchen! I am going crazy trying to find the fabric used for those curtains. Every time I watch the show I fixate on the windows. I now think they are a toile damask as I do not see any human figures in the print. There is no way to contact the set designer. I hope we get a response here. June, I did leave a comment — try Country Curtains, that would be my best bet idea to find something similar. 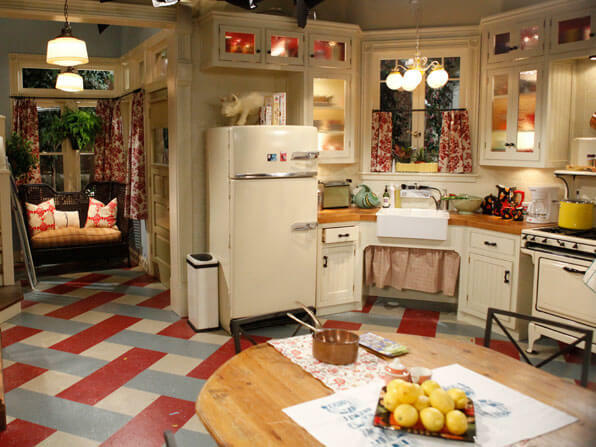 There is nothing in Country Curtains that resembles those curtains….still looking for the red kitchen curtains! If anyone knows where to find them, please leave a comment on where you have actually seen them! Thanks! Try searching “red toile” curtains. Again, google red toile curtains, I see many come right up. I’m on a mission to find a china cabinet/hutch like the one on the show. My wife says she wants one just like it. Can anyone point me in a likely direction?